All the vital details for this season's Sussex Senior Cup have been revealed. It will be played on the evening of Tuesday, May 7, at Brighton's Amex Stadium - the fourth consecutive year it has been staged under lights at the ground. 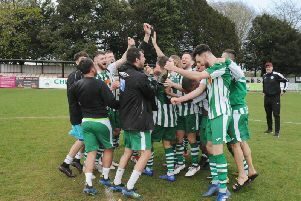 Bognor will face Burgess Hill Town in this season’s final, the sides having beaten Brighton U23s and Haywards Heath in their respective semi-finals. The Rocks have a rich history in the competition, having last won it in 1987, reaching the final as recently as 2014, when they were defated 3-0 by Peacehaven. The Hillians haven’t reached the final since 1998 and last won it back in 1886 when Queen Victoria was still on the throne. Ken Benham, chief executive of the Sussex County FA, said: “We’re delighted to be able to hold the final of the Sussex Senior Challenge Cup at the Amex Stadium again this season. “Like the last few years, the final will be held on a midweek evening, which is normal for the competition with games in previous rounds taking place then. An evening match at the Amex is always a special atmosphere, couple that with the fact it is a cup final between two well-established and well-supported non-league Sussex sides, it should be a fantastic night and we are very much looking forward to it."